The owner of Stained Skin and has 20 years tattooing experience. 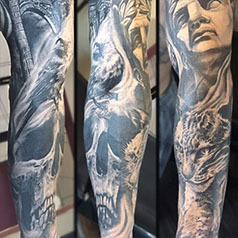 Japanese, American Traditional, Black and Grey. Tattooing since 2008. 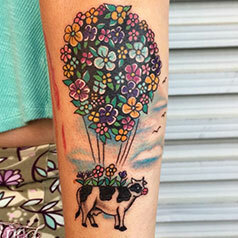 Specializing in American Traditional, bold colors as well as black and grey. Tattooing for 6 years. Specializing in new school / neo traditional, though I am open to many styles. I am a big fan of prismacoloring, drawing, and painting. Started apprenticeship in May of 2018 under mentor Anthony Dubois. The Mighty Stained Skin is located at 1255 North High Street in Columbus, Ohio, a part of the Short North Arts District. 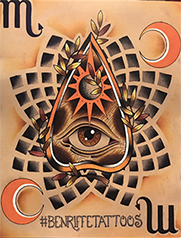 Upon arrival at Stained Skin, you’ll find a relaxed atmosphere, receive exceptional customer service, and speak with incredible artists about your future tattoo. The artists at Stained Skin have tattooed many nationally touring music groups including The Mighty Mighty Bosstones, Good Charlotte, Papa Roach, Face to Face, Hot Water Music, Defeater, Beartooth, as well as comedian and actor Faison Love, just to name a few. A wide array of guest artists have come through Stained Skin throughout the years. Some of these artists include: Timothy Hoyer, Joe Capobianco, Eric Merrill, Chris O’Donnell, Casey Korclik, St. Marq, and Steve Haworth, upon others. We continue to have many incredible guest artists come through whenever possible. The studio is eye candy for anyone who appreciates art, with original fine art installations throughout the shop. The gallery at the Mighty Stained Skin has rotating shows every month which are open to the public. 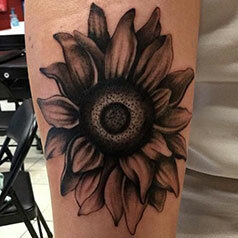 Tell us about your idea and we will get you in for a consultation with the best artist for your next tattoo. We host regular art shows at Stained Skin. If you are an artist and would like to show your work here, call the shop and ask for Kat. Check out the rest of our photo galleries from past Stained Skin Art Shows HERE.